We are learning more and more about Far Cry 5, particularly, the full cast of characters we will be encountering as we explore Hope County. Today Ubisoft dropped a new trailer detailing all of the guns for hire, or allies you will be able to work with as you attempt to start a full scale rebellion against the doomsday cult that has taken hold of the area. We’ve seen a few of these characters in previous trailers, but this is our most detailed view of their role in the game to date. The trailer shows a profile of each companion, their specific strengths, and what they are fighting for. There’s Nick Rye, the wild country boy pilot who provides air support from his plane. You can call him in for a strafing run on an unsuspecting camp, or use him as support when you’re stuck in a firefight. Soon to be a father, he’s fighting for his family and their future. The other resident pilot is Adelaide Drubman. Her specialty is helicopters. When you call her up, she brings her chopper and with it, plenty of firepower. She’s got a big gun with a bigger magazine which means less time spent reloading and more time taking out bad guys for you. She’s fighting because no one tells her what to do, not even terrifying cults. There’s also Sharky Boshaw, the resident pyromaniac. Rounds have an increased incendiary chance and Sharky is very resistant to explosions and impact damage, making him a good man to have on your side. According to the trailer he’s fighting because…well he has no friends. Master hunter Jess Black and her compound bow will likely be the favorite of stealth players. Enemies will have a harder time spotting her creeping through the trees. Wilds animals will view her as one of their own and will leave her be as she works. She’s fighting for revenge. For what, we aren’t sure, but I for one wouldn’t want to cross her. Grace Armstrong is a former Olympic sharpshooter and army sniper. With sniper shots that will send enemies running for their lives, and an easily identifiable sight so she doesn’t accidentally send you running, she’s a valid asset to have waiting on the high ground. Grace is fighting to keep hope alive. Would it be a Far Cry game without Hurk? Returning from appearances in Far Cry 3 and Far Cry 4, Hurk Drubman Jr. is “just dangerously stupid.” His RPGs do more damage to vehicles. They will also track those vehicles while they are in motion, which is shown to be particularly useful on a pesky helicopter. Hurk is fighting for Hurk. And maybe beer. 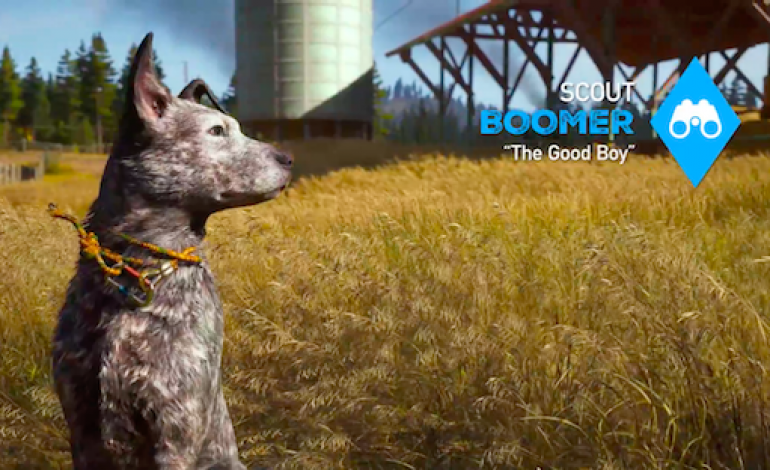 And of course, we can’t forget Boomer, resident good boy and ferocious attack dog who will take down enemies and even steal their weapons and bring them to you. The bad men killed his family, but you’re his new family and now he fights for you! For a closer look at all your potential allies, you can view the full trailer below. Far Cry 5 comes out March 27. And don’t forget about the Season Pass which has already teased some interesting expansions, including a trip to Mars.